Haigha’s Form is Highway Hill’s fantastic communal-area, a 5×9 metre safari-style tent that provides an extra spacious but cosy space for our visitors to relax in and engage in more sheltered activities. Haigha’s Form contains a small but well-equipped kitchen area, dining tables, a hangout zone with three comfy sofas, and a woodburning stove to keep you warm on chilly nights. There is also a covered deck for guests to enjoy when they would still like to be outside but sheltered from more dubious weather or the heat of the sun. Access to Haigha’s Form is included in all shepherds hut and bell tent bookings and is a perfect space for groups who book more than one accommodation unit to have an indoor space for hanging out and making food together. This space is also useful for guests staying in bell tents, as these do not have their own cooking facilities. 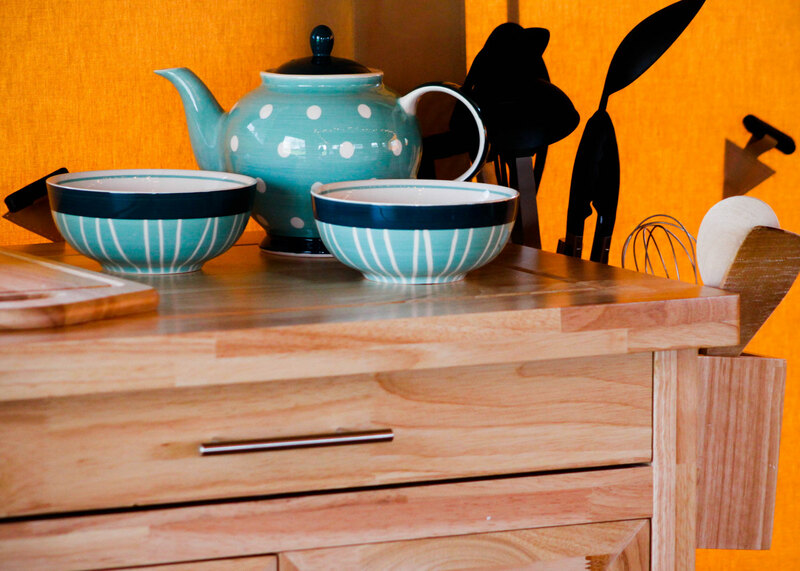 With its well-equipped kitchen area and cozy sofa area, Haigha’s Form offers a space for you to relax and hang out before, during, and after your events or activities held in other Highway Hill facilities. The space can be booked as an add-on to a Hayloft or Potters Wood booking, as a perfect place to cater your event and socialise after a long yoga session or bushcraft class. Haigha’s Form is available for individual hire to hold events such as cookery demonstrations, parties, or cookouts. The space is perfect for getting together with a large group of friends in nature, with a well-equipped kitchen and large enough space to feed everyone whilst also offering outside space to sit and socialise, for children to run and play, or for adults to build a fire in the fire pit. Haigha’s Form can be used as an add-on space to any other facility all year round, for the bargain price of £15 for the day. 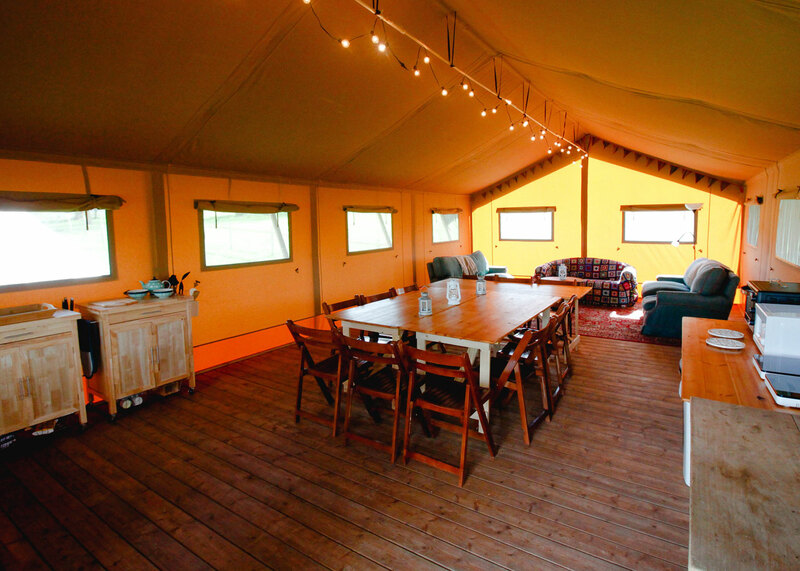 During the months that our glamping site is open (April to October inclusive), this will not be an exclusive hire as there may be overnight guests using the space as well. Guests will be informed that a private group will be using the space during your event but they have the right to continue accessing the space as they wish. During the winter months, November to March, Haigha’s Form is available for exclusive hire at the rate of £50 for a half day (4 hours) and £100 for a full day (8 hours or more). Worried it might be too cold to use? Not to worry, there is a very effective woodburner to keep you warm and toasty during your hire! WANT US TO PLAN THE EVENT FOR YOU? Highway Hill’s associates use our spaces for a variety of different activities, most of which are open to the public or bookable for private events or activities. We regularly host yoga sessions and retreats, bushcraft classes, archery, and parties. Our team can arrange bespoke packages for you to host a day or weekend event or activity from our menu of contacts to create the best possible experience for you at Highway Hill.